Premier League Tranent secured their place in the final of the Miller Cup as they edged their last-four clash with North Merchiston Vale 2-1. 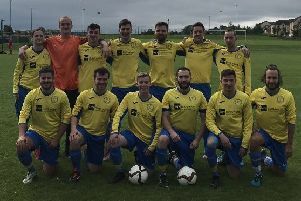 The East Lothian men will face Carluke Hearts in the final at Peffermill next month thanks to Anton McKillop’s controversial late winner, with the visitors believing he had put the ball into the net with his hand. Neither side could make an impact in the semi-final clash in a first half which was not helped by the weather, with the wind making it difficult for both sides. Tranent felt they should have had a penalty when John Ferguson was upended just inside the area, but the referee waved play on. Daniel Gilles then had a chance to open the scoring for the home side, only to put the ball over the bar from 12 yards out. The hosts had the better of the early stages in the second half and struck first on the hour mark. David McIntosh played a short corner to Kyle Williams who whipped the ball into the danger area and Steve Glynn was there to prod the ball into the back of the net. North Merchiston Vale equalised ten minutes later with home defender Scott Newlands inadvertently sending a header into his own net. Tranent were desperate to secure their place in the final, however, and did so late on when McKillop found the back of the net from Williams’ ball into the box which created havoc in the visiting defence. Edinburgh South Vics thumped Barca Milton 97 6-1 to ease through to the semi-finals of the RJM Sports East of Scotland Cup. The Premier League club made their elevated league status show against their second tier opponents as they braved the cold and wind. Barca were in fact in front after ten minutes through Stevie Adam, but that was their only moment of joy on a difficult afternoon as Vics came out fighting. A stunning strike from Mikey Kennedy drew Vics level before Stuart Cotton gave them the lead. A Ryan Moore hat-trick put the hosts well in the ascendancy, before James Hunter added a sixth late on. Vics will face Callander Thistle of the Caledonian League in the semi-final at the Falkirk Stadium next month.